The Silverado is the premier pickup truck that power lovers appreciate. The S10 is for economy, but it is the Silverado that is used by the big boys. Our 5.7-liter crate engines from GM performance are a perfect swap for your worn out engine. Our Chevy Silverado crate engines for sale can be installed quickly and need no further adjustments. We price these engines lower than what you have already seen online. We are in the business to sell crate engines and not to have them look pretty on our warehouse shelves. We sell to real people that are searching for a fast replacement and we deliver. Our crate engines come complete. They are not missing important components and we don’t just sell you the block. We know that you are searching for the easiest way to replace a blown or worn out motor. Bolting down our crate engines is easy. You can do it yourself or hire out the job to a qualified mechanic. Our engines arrive without damage and this makes it even easier to install them. You just have to uncrate each engine, line it up and bolt it into place. Each of our Chevy engines come with OEM parts and are not cheap rebuilds. It would be great if we could tell you that an engine that we build does not need any type of testing. We know that is far from the truth. It does not matter how we build a crate engine. What is important is that the parts work as intended. Many failures in crate engines are actually due to bad OEM components. We still dyno test every crate engine to be sure it is free of fluid leaks, wiring damage or bearing issues. We use the results of the tests to measure the performance and accuracy that we put into every engine rebuild. We pay our mechanics good money to build us a lasting supply of crate engines for sale and we take putting our name on our engines seriously. Shipping is serious business to us. The 5.7-liter engines that make it out of our engine shop are crated properly and immediately scheduled for shipment. Our thorough testing will guarantee that our engines arrive much faster than normal. We protect each engine that is shipped and know how delicate a crate engine is during transport. Our carriers know how to professionally handle each and every one of our Chevy Silverado engines for sale. We prevent damage and loss to our engines by working strictly with complete freight professionals that deliver our engines on time. 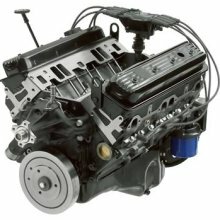 When you need a great crate engine, we are the number one source for GM performance crate engines. Use our quote form and check your email afterward. Our lowest price will show up there. Call us and we can tell you more about our crate engines over the phone. We are really honest people with a passion for selling GM crate engines. Our Chevy Silverado crate engines for sale are priced really low to make you happy.